Ramba is 23 years old. She comes from a poor family in a place called Dang in the south-west Terai region (which borders India). She was married at the age of 13 and the following year, aged 14, whilst cleaning her parents-in-law’s house, she fell from the second floor and fractured her spine. She was taken to the local hospital but due to inadequate Government resourcing and funding, treatment was simply not possible. She was transferred to a larger center and operated on and then sent back to her village. Tragically, she became bed-ridden. Her husband started neglecting her and after a year he left her and told her to go back to her parents, which she did. Ramba remained completely bed ridden for three years. Finally her brother and sister decided they would motivate her to walk again. 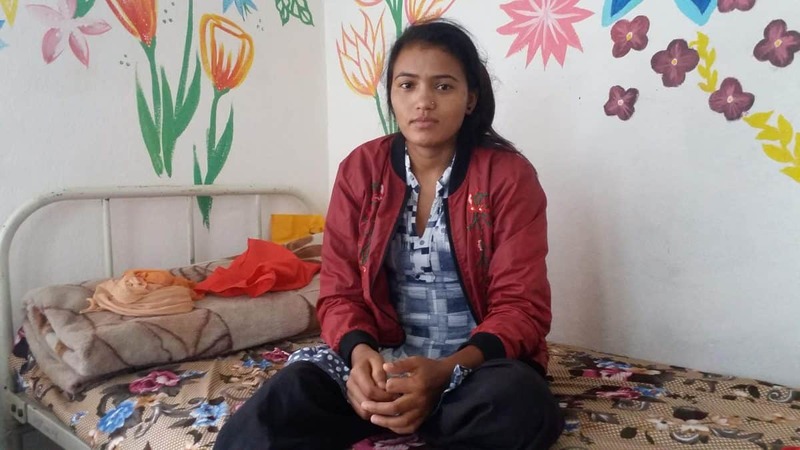 Seven months later she was able to take a few steps but life is not kind to many people in Nepal – when she turned 19, her mother died, and her father married another woman. Her step-mother was cruel to Ramba and started to beat her, so she and her younger sister left and moved into a rented room. Eventually she was able to find a job as a guest worker in India working for a textiles factory. Her job was to encourage people in Nepal to work for the same factory, and she was paid a commission for every employee she brought to them. It would take her four days to make the round-trip, but she only needed to find two people a month to earn NPR 10,000 (approximately $110) It was enough money to pay her and her younger sister’s rent, living expenses and their education. Ramba worked really hard to make a success of her life and two years ago, at the age of 21, she graduated from high school with not just her School Leaving Certificate (the equivalent of our Year 10) but her + 2 (our equivalent of Year 12). A few months ago, Ramba began to experience increasing weakness in her legs and started worrying about her future. She managed to find help from a friend who also had a spinal injury and advised her to go to an organisation called the National Disabled Fund (NDF) in Kathmandu. It took two months for supportive friends and family to find the financial resources to make this happen, and eventually she and her sister were able to make the 14-hour bus journey to Kathmandu armed with NPR 25,000 (approximately AU$ 305). They knew no one, had never been to Kathmandu and had never even heard of physiotherapy. They managed to rent a room in a hotel for NPR 7,000 (AU$80) a month. They then went to NDF where the physiotherapist advised Ramba that she could help her walk properly again, but she would have to continue physiotherapy for 3 – 4 months at NPR 50/day (AU$0.60) Their funds only lasted a month and although Ramba searched high and low for a job, no one was willing to employ someone with a disability. In desperation, Ramba took the advice of someone she met in Kathmandu who told her about a thermal therapy that he said would fix her. Unfortunately, it was a scam, and not only did she spend precious rupees on the treatment, she acquired a large burn in her pelvic area and had no money left to pay for treatment for her newly acquired wounds. A fellow patient, who attends NDF for physiotherapy told Ramba about NHEDF and asked her to call them. After hearing her story NHEDF admitted her to the Shelter where she is receiving daily dressings to her burn and regular physiotherapy. NHEDF’s goal is to help her walk again, so she can live with her disability, earn a living and survive. Previous Previous post: Meet Bharat and read his story…. Next Next post: Read our latest newsletter to get a feel for our wonderful work!